Respondents in Turkey appear to be much more inclined to request payment from B2B customers using methods which do not expose them to the risk of payment default on invoices. On average, 40.3% of the total value of their sales to B2B customers was made on credit. This is almost in line with the average for Eastern Europe (39.8%), and places Turkey in between two clusters of Eastern European countries. The first cluster comprises the Czech Republic (with an average of 44% of the B2B sales value made on credit) and Hungary, the country most inclined to use trade credit in B2B sales (with an average of 54% of B2B sales made on credit). The second cluster includes Poland (where the B2B credit sales value averages 35%) and Slovakia, which seems to be the country in Eastern Europe most averse to granting trade credit in B2B transactions (on average 27% of the B2B credit sales value was on credit). Unlike to what was observed in the other countries surveyed in Eastern Europe, respondents in Turkey show the strongest preference to using trade credit with domestic than with foreign customers. 48.1% of domestic B2B sales and 32.4% of foreign B2B sales were made on credit (averages for Eastern Europe: 42.9% domestic and 36.6% foreign). This is likely to reflect the relatively closed nature of the Turkish economy, expected to grow only moderately this year (around 3%), driven mostly by domestic demand. Due to subdued economic growth, credit risks in Turkey remain high, thus impacting business sentiment. 88.3% of respondents in the country (Eastern Europe: 85.2%) reported late payment of invoices by domestic and foreign B2B customers over the past year. This resulted in an average of around 57% of B2B receivables remaining unpaid past the due date. This is well above the average for Eastern Europe (around 43%), and is the highest default rate of all the countries surveyed in the region. Late payment by domestic customers was reported to occur much more frequently than that from customers abroad. This is similar to what was observed in Slovakia. Compared to last year, both domestic and foreign default rates in Turkey increased. The increase in the domestic default rate is more significant than that for the region. Late payment of B2B invoices in Turkey (domestic and foreign) is reflected in the Days Sales Outstanding (DSO) figure posted by respondents. In Turkey, this averages 63 days (survey average: 57 days), is the second highest after that of Poland, and is three days longer than last year. This may reflect lower efficiency in collecting high value invoices. Far more respondents in Turkey (33%) than in Eastern Europe (21.5%) expect a strong increase in DSO over the next 12 months. However, half of the respondents in the country, compared to nearly 66% in Eastern Europe, do not expect any changes in the DSO figure over the same time frame. No change in DSO is expected by half of the respondents in the country, compared to nearly 66% in Eastern Europe. Respondents in Turkey will need to face a number of challenges this year and therefore, they will need to better protect their businesses to assure profitability. Bank lending restrictions worry more respondents in Turkey (11.3%) than respondents in other Eastern European countries (7%). This is also the case for collection of outstanding invoices in emerging markets (12.3% of respondents in Turkey versus 7.4% in Eastern Europe). Payment terms extended to domestic B2B customers by respondents in Turkey average around 43 days from the invoice date, are markedly above the average for Eastern Europe (30 days) and are the longest observed across the countries surveyed in the region. Foreign customers are requested to settle invoices on average 10 days earlier than domestic customers. This may suggest that Turkish respondents tend to offset the high level of domestic payment default with swifter payment terms granted to foreign customers. Over the past year, however, both the average domestic and foreign payment terms have been shortened by an average of four days. This may be read as an attempt of businesses in Turkey to cope with the challenging credit risk environment in which they currently operate. Despite notably shorter payment terms granted to foreign customers, both foreign and domestic customers settle past due payments within an average of 40 days after the invoice due date. This means Turkish respondents turn past due receivables into cash, on average, nearly three months from invoicing (average for Eastern Europe: 52 days). This is twice as long as the average payment duration observed across all of the remaining countries surveyed in Eastern Europe. Almost the same percentage of respondents in Turkey (66.1%) as in Eastern Europe (64.4%) reported that domestic B2B customers pay invoices late due to liquidity issues. This has increased notably compared to one year ago. In line with the survey pattern, the second most often cited reason for late payment of domestic invoices is the intentional use of outstanding invoices by B2B customers for their financial advantage. This was cited by 30% of respondents in Turkey compared to nearly 33% in Eastern Europe. This is in line to last years’ observations. Twice as many respondents in Turkey (36%) than in Eastern Europe (18%) said that late payment from foreign customers is most often due to inefficiencies of the banking system. This is the highest percentage of respondents citing this delay factor of all the countries surveyed in Eastern Europe. Foreign late payment due to customers’ liquidity issues is reported by respondents in Turkey (36%) almost as often as those in Eastern Europe (around 37%). 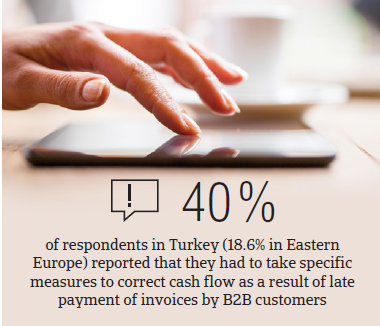 Over twice as many respondents in Turkey (40.4%) than in Eastern Europe (18.6%) reported that they had to take specific measures to correct cash flow as a result of late payment of invoices by B2B customers. 31.4% of respondents in the country (27.2% in Eastern Europe) reported that they had to postpone payments to their own suppliers. To protect the business against the risk of payment defaults from B2B customers, around 30% of respondents in Turkey (25% in Eastern Europe) will increase the use of credit management tools (customers’ creditworthiness and payment history checks, credit risk monitoring, request of secured form of payment) over the next 12 months. The proportion of B2B receivables, reported by Turkish respondents as uncollectable, is on average twice as high as that at regional level (2.2% of the total B2B credit sales value, versus 1.2% in Eastern Europe). Uncollectable receivables consisted almost entirely of domestic write-offs. Uncollectable domestic B2B receivables originated most often from the construction, food and textiles industries. 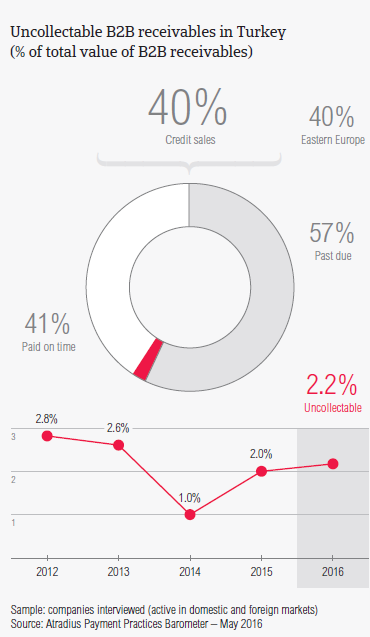 Around 44% of respondents in Turkey reported that B2B receivables were uncollectable mainly due to the failure of the collection attempts (respondents in Eastern Europe: 34%) and because the customer went bankrupt or out of business (respondents in Eastern Europe: nearly 55%). 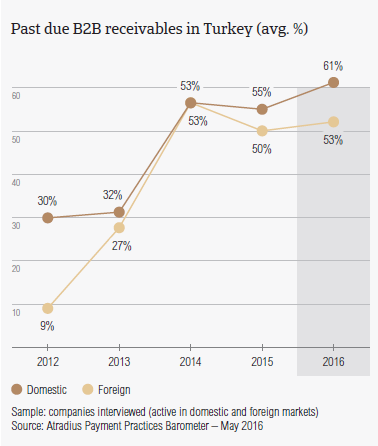 Survey respondents in Turkey reported granting trade credit terms mainly to B2B customers in the construction, consumer durables, food, textiles and services industries. Invoice payment terms extended by respondents in Turkey to B2B customers in the construction industry are significantly longer than the country average. Despite lenient payment terms, B2B customers in the construction industry settled overdue invoices the slowest and generated an above average (for the country) proportion of overdue invoices. According to most of the respondents (62%), this is likely to be chiefly due to liquidity constraints of customers in this industry. Nearly 60% of the respondents in Turkey expect payment practices of B2B customers in the consumer durables industry to deteriorate significantly over the next 12 months. 52% of respondents expect a worsening of payment practices in the construction industry over the same time frame. No significant change is anticipated in respect to payment practices of other industries.